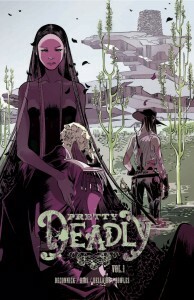 Pretty Deadly was my first exposure to “weird western”, a genre I knew existed but had never read. Things first get weird when we meet the narrators – a butterfly and a dead rabbit – and that’s only a taste of what’s to come. This first volume focuses on the adventures of Sissy, a girl wearing a vulture cloak, and Fox, an old blind gunman who sees more than you might think. Fox and Sissy make ends meet by traveling from town to town telling the story of the Mason and his wife, Beauty, who he locked up in a stone tower. When Beauty despaired of her prison, she asked Death to come for her and take her away, but when he arrived, Death fell in love, and their union produced a baby. That baby grew into Deathface Ginny, a relentless killer who comes to the aid of those in trouble if they sing her song. Needless to say, it isn’t long before Fox and Sissy are on the run from another killer named Big Alice and one of their friends summons Deathface Ginny. This results in a sword fight in the desert between the two women, one of whom has a skull tattooed on her face. It turns out that Fox and Sissy are on the run because there is more to Sissy than meets the eye, and all the players soon converge in a series of bloody gun and sword battles that lead them right up to Death’s door. In some ways, Pretty Deadly reminded me of The Sandman’s penchant for dark supernatural stories set in the intersection between myth and reality. However, the characters were a bit flat, and I had a hard time keeping all of their motivations straight. Part of the reason for this is that the book feels overstuffed; we’re introduced to a decently large cast of characters in a very short amount of time, and none of them are given much depth. The pacing felt rushed, and the story relied more on bloody mayhem than genuine character moments. Also, this volume reads like a fairly complete story arc. I’m not sure where the next book might go from here, and I’m also not sure who the viewpoint character(s) will be. The last page implies that Deathface Ginny will be the focus of the next volume, but that feels like an odd choice, simply because we spend more time with Fox and Sissy. So far, Deathface Ginny is nothing but a one-note killer with supernatural origins, and I can’t see myself being invested in a story with her as the focus. However, I suppose it’s also possible that the author will use Ginny as a gateway character into stories about other characters, much like Dream wasn’t necessarily the main character of The Sandman for its entire run. As for the art, it’s striking, but the action scenes are so stylized that they are oftentimes hard to follow, which is a fatal flaw in a book so full of action. Ultimately, I wasn’t drawn into the world of Pretty Deadly, and I probably won’t pick up future volumes.